Weeks after a passenger was dragged off a United Airlines flight, a House committee grilled airline industry representatives at a hearing. Bill Shuster, House Transportation and Infrastructure Committee chairman, had a warning for airline industry executives and representatives before they testified Tuesday on Capitol Hill. "This won't be a pleasant hearing for the witnesses today," Shuster said. The House Transportation and Infrastructure Committee hearing comes just weeks after a passenger was forcibly removed from a United Airlines flight. But United Airlines CEO Oscar Munoz and President Scott Kirby weren't the only executives in attendance. Alaska Airlines, Southwest Airlines and American Airlines all sent representatives. Lawmakers from both sides of the aisle didn't pull any punches. "How about a simple disclosure? I mean, this is United's contract of carriage. This is just for fares. I mean, if you look at the print here — very user friendly," Rep. Peter DeFazio said sarcastically. The airline officials all said they'd like to simplify those contracts. "We're gonna hold you all accountable for that and see who's best at doing something you may have learned to do in college if you had good writing instruction," Rep. Eleanor Holmes Norton said. Lawmakers also asked the executives how their airlines determine who to bump involuntarily from an overbooked flight. "So this fare was just cheaper than the rest of them? The cheapest, I guess," Rep. Eddie Bernice Johnson asked Munoz. "It was one of the lower fares, yes," Munoz said. "And what about the rest of you? Is that the way you determine who to mistreat?" Johnson asked. Other lawmakers seemed to just want to use the allotted time to vent their frustration with the airlines. "What I have heard a lot of you talk about is competition. Explain that to me, 'cause I think that's a joke. 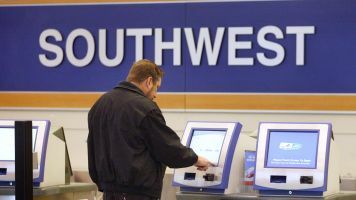 That's an absolute joke that there's competition within the airline industry," Rep. Duncan Hunter said. "The problem with the flying experience is across the board. We all know it's a terrible experience. ... But there will come a day when Congress won't accept it anymore on behalf of the American people," Rep. Michael E. Capuano said. Shuster threatened federal regulation in the future if the airlines don't improve their customer service. "Seize this opportunity because if you don't, we're gonna come — and you're not gonna like it," Shuster said.